The Other Side of Will: A Solution to the Suarez Bite Scandal? 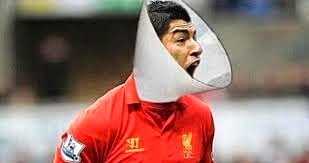 A Solution to the Suarez Bite Scandal? So what is FIFA going to do with Luis Suarez? Clearly Uruguay doesn't want to lose him for the rest of the World Cup, and yet his opponents shouldn't have to get a tetanus shot every time they play against him. Heavily fine him could work, but I doubt it. Suspend him might also be an option, but I doubt that would work either. He's done it before, and he'll no doubt do so again. Perhaps the lampoonist creator of this picture is on to something. Luis, do you want to continue playing the world's greatest game? If so then the cone needs to be a part of your uniform. Other sports require some form of head protection, albeit normally for the protection of the athlete himself, and not necessarily for everyone else in the game. But seriously? What's wrong with this guy? 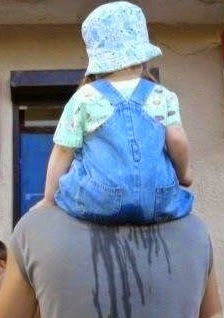 At the very least he should have been red-carded! That's the way I see it anyway. Man Versus Bird: Who Is Fooling Who? The Man Who Became Toast?